LONDON KY—On Saturday, March 18th at 3:20 a.m. London Police Ofc. 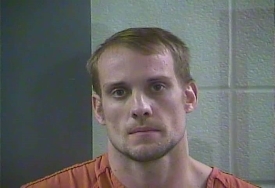 Jacob Bormann conducted a traffic stop on a Nissan Altima pulling out of the BP Truck Stop on KY-80 with one headlight. Through investigation, Scottie J. Couch, 41, and Travis R. Stacy, 29, of Pine Grove School Road in London were arrested. When Ofc. Bormann made contact with the driver, Couch, on the I-75 South Exit Ramp from KY-80, he appeared extremely nervous. Consent was given to Police to search the vehicle and a container in the middle of the rear seat was located with a glass pipe with residue, and two clear plastic baggies containing a white crystal substance. The substance field tested positive for methamphetamine. Stacy was a passenger in the vehicle. Sgt. Eric Wilkerson assisted Ofc. Bormann at the scene and conducted a field sobriety test on Couch. Couch admitted to being under the influence of meth and Narcos, which he had been prescribed. Couch was arrested and charged with one-headlight, operating a motor vehicle under the influence, first-degree possession of a controlled substance, and buying/possessing drug paraphernalia. Stacy was arrested and charged with first-degree possession of methamphetamine and buying/possessing drug paraphernalia. 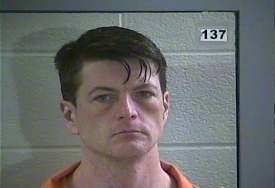 Both were lodged in the Laurel County Detention Center.